Amazon Kindle Fire HDX 8.9, Kindle HD, Kindle Voyage: It's becoming a gadget company. Amazon’s line of tablets keeps growing. Seven years ago, Amazon released its first gadget, the Kindle. An instant hit, it helped pave the way for the tablets of the future. But while Amazon produced successors to the Kindle, it didn’t follow up with a full-fledged tablet of its own until late 2011, a year-and-a-half after Apple announced the iPad. And it wasn’t immediately clear whether the Kindle Fire, with its attractive price but mediocre quality, would have staying power. As recently as a year ago, it was fair to say that Amazon was still “dabbling” or “experimenting” in the consumer electronics business. Not anymore. On Wednesday, Amazon announced not one, not two, but six new devices: four Kindle Fire tablets and two Kindle e-readers. Not one is revolutionary. Each is either a successor or a variation on some device that has come before. But each appears to be a worthy competitor in its category, and at least a couple of them appear to set new bars in quality-to-price ratio. Throw in Amazon’s new smartphone and set-top box, and you have a product line whose range and quality is beginning to rival that of the world’s leading consumer electronics companies. Heads up, Samsung and Apple: Amazon is not messing around. 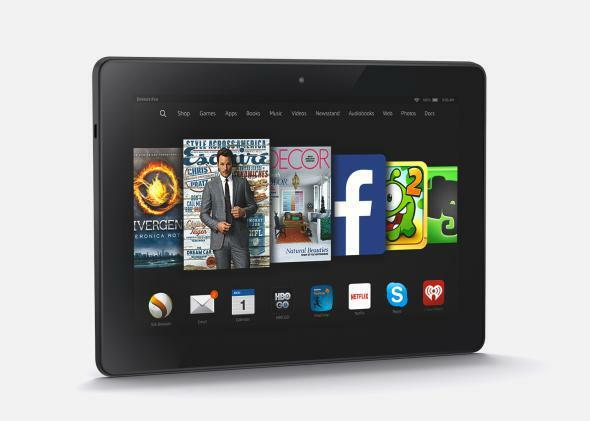 The new Kindle Fire HDX 8.9” starts at $379. 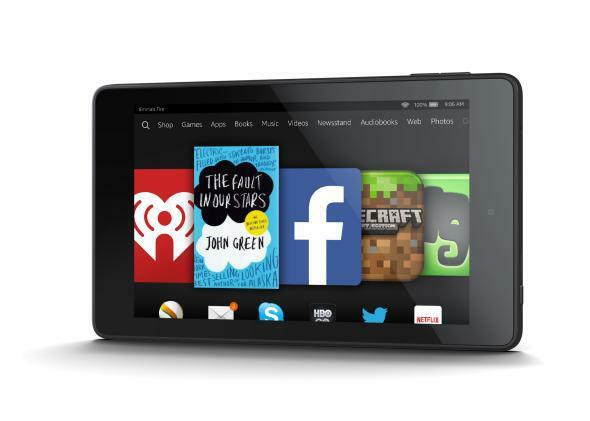 The flagship of Amazon’s new line is a new Kindle Fire HDX 8.9-inch tablet. At $379, it’s the finest of Amazon’s hardware offerings—but maybe also the least interesting. Yes, it’s 20 percent lighter than the iPad Air, boasts a snappy processor and high-resolution display, and comes with perks like Dolby Atmos surround sound, a first for a tablet. Watch Transformers on it, and your senses will be as thoroughly assaulted as Michael Bay intended. It also pairs nicely with an ultra-thin Bluetooth keyboard and comes with some interesting software features, like Firefly, that Amazon first introduced earlier this year with its quixotic Fire Phone. In short, the new HDX looks like a worthy follow-up to its predecessor, but nothing scintillating in the scheme of things. At $99, the Kindle Fire HD 6” is priced more like a toy than a tablet. More intriguing are a trio of new low-end offerings, starting with the Fire HD 6” and Fire HD 7” tablets. At $139, the 7-incher is the same price as its predecessor, which was already extremely cheap for a tablet. But at $99, the 6” Fire HD’s price is almost eye-popping. It’s the price that a lot of industry watchers were hoping for way back when Amazon introduced the first Kindle Fire three years ago. Amazon couldn’t pull it off then, but apparently it can now. It came about, Amazon vice president Peter Larsen explained, because Amazon saw that a lot of people were buying sub-$100 tablets on its website. But those tablets, by and large, haven’t gotten very good reviews. Among other problems, customers complain that their cheap tablets are poorly constructed, break easily, run slowly, and sound tinny. Amazon sought to address those issues with its Fire HDs, which offer crisp, high-definition displays, peppy processors, Gorilla Glass screens and sturdy frames that don’t break when you drop them. More importantly, at $99, the Fire HD 6” is priced more like a toy than a computer, which is refreshing at a time when Apple and Microsoft are making tablets that soar past the $500 and creep toward $1,000. 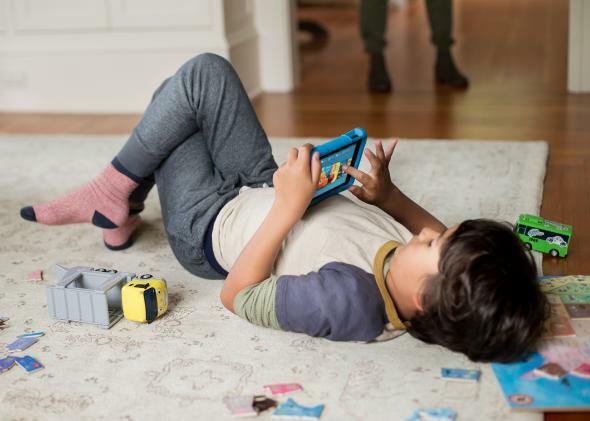 Some might even be tempted to buy one just for their kids—which is where Amazon’s fourth new tablet, the Fire HD Kids Edition, comes in. 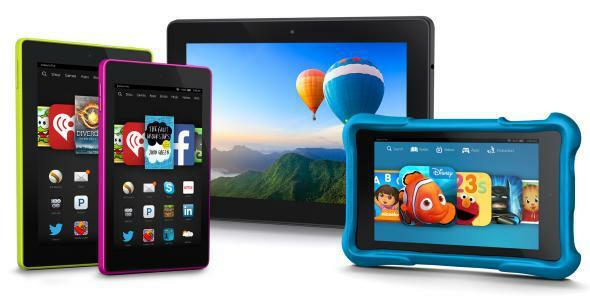 If your kid breaks the Amazon Fire HD Kids Edition, Amazon will replace it for free. The Kids Edition, which is a variant of the Kindle Fire HD that uses the same hardware, actually starts at $149 for the 6” version, not $99. But Amazon more than justifies the extra cost. First, the Kids Edition comes with a bulky, brightly colored case that keeps the tablet safe from all kinds of drops and spills. But Amazon also recognizes that kids are quite resourceful when it comes to ruining things—and so it throws in a 2-year “no-questions-asked” warranty. “If they break it, we’ll replace it,” Amazon pledges. Do your worst, kiddos. On top of that, the tablet comes with a year’s subscription to FreeTime Unlimited, a sort of Amazon Prime for rugrats that offers free access to a wide library of children’s content. And it has built-in settings that block access to the Amazon stores and in-app purchases, so your 4-year-old can’t surprise you with hundred-dollar presents while your back is turned. The Kids Edition also makes it easy to set time limits on the kids’ usage of the tablet, or to require that they complete certain educational tasks before they can play games. The $199 Kindle Voyage is pricey for an e-reader. Finally, there are two new Kindle e-readers. Devices with grayscale screens that do little more than display text aren’t as exciting in 2014 as they were in 2007, of course. But Amazon has managed to keep the Kindle line relatively fresh with incremental improvements that hold value for bibliophiles, if not Michael Bay fans. At $199, the new Kindle Voyage is pricier than you’d expect for an e-reader, but appears to offer about the best reading reading experience you can get anywhere (outside of, you know, an actual book). 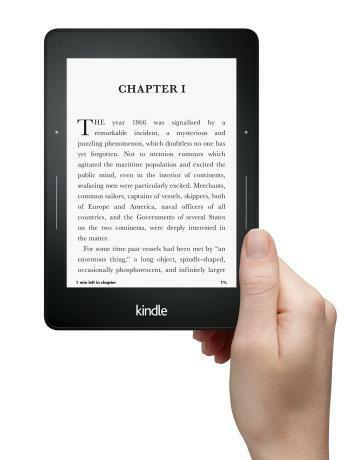 Ultra-thin, with a razor-sharp display and an adaptive front light that automatically adjusts the brightness to match that of the room, it’s really a niche device aimed at Kindle addicts with money to spare. It comes with free 3G data service, so you can download books even without Wi-Fi. Finally, the new base Kindle comes with a touchscreen at last. At $79, it’s the price of a few hardbacks. With the exception of its e-readers, Amazon has yet to dominate any of the hardware categories it has entered. And its first foray into phones looks like it could be a straight-up flop. But with Wednesday’s new releases, its tablets now appear to be right up there with those of Samsung, Apple, and Google. And the Fire TV already vies with the best set-top boxes. In short, Amazon is now a viable consumer electronics company, in addition to being an online megastore, a cloud services provider, a television studio, and all the other things that Amazon has become. What makes Amazon so dangerous as a hardware company is that it doesn’t have to make money on its hardware. What was true of the original Kindle remains true of all the company’s Kindles and Kindle Fires today: More than gadgets, they’re gateway drugs for all the other stuff you can buy on Amazon. Only now the gateway drugs are getting pretty addictive in their own right.